Creating with natural materials is so inspiring. 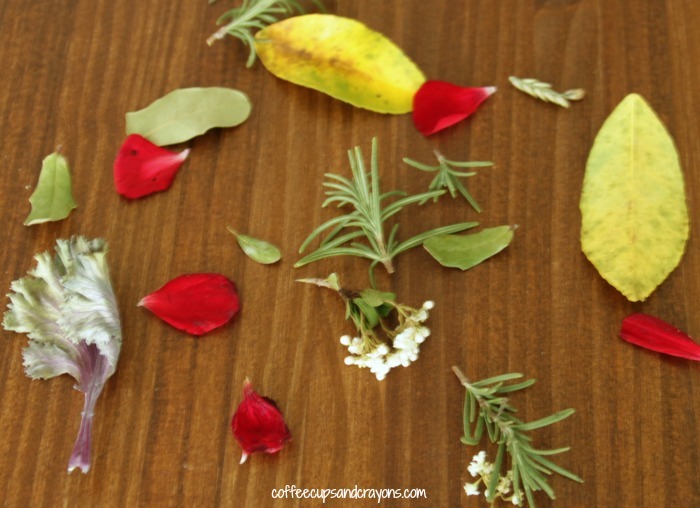 My kids love to go on nature walks and observe and collect little treasures. We have glass bottles filled with all sorts of things they’ve fallen in love with outdoors. 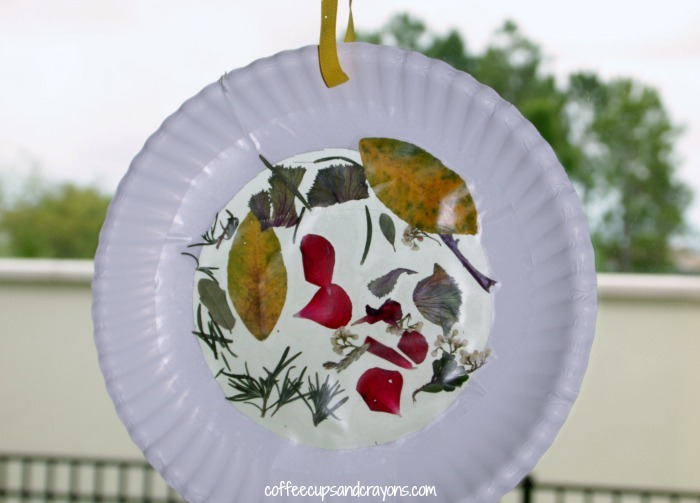 We received a review copy of The Artful Year by Jean Van’t Hul (affiliate link) and I was not surprised at all to see that that they kept coming back to the nature suncatcher craft. The theme of The Artful Year is to create and celebrate together as a family. She includes art, craft and recipe ideas that will inspire you throughout the year. We are big on family traditions in our family and love to create for the holidays so I was very excited to get the book. Once it arrived I was even more excited to see how do-able and simple the ideas were to use and adapt to fit our family. We are all about simple and low stress around here and I found her ideas inspiring–not to do more, but to really connect and be together creatively. Now on to the suncatchers! 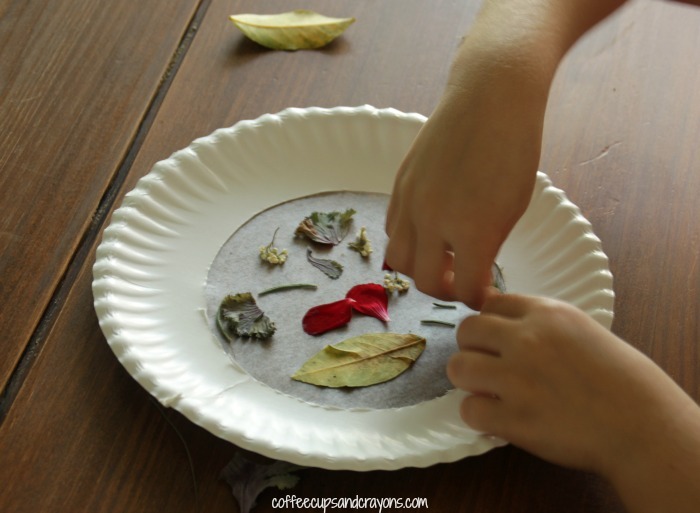 We went on a nature walk and the kids collected bits and pieces of flowers and leaves that they found. They even added a little rosemary and purple cabbage leaves from our fairy garden. Then we cut a hole in the center of the plate and I cut out two circles in contact paper. Jean suggests folding the paper in half and cutting the the circles at the same time and it worked perfectly for us. I stuck one of the sticky circles on the back of the plate and they added the flowers and leaves. They all smelled so so good that the craft became a multi-sensory experience. When the kids were satisfied I stuck the other circle on top of the collage and strung the ribbon through the top. They are just gorgeous to look at hanging in our dining room window. The Artful Year is set up by season and holiday and I love how she included ways to adapt the different activities for the different times of year. 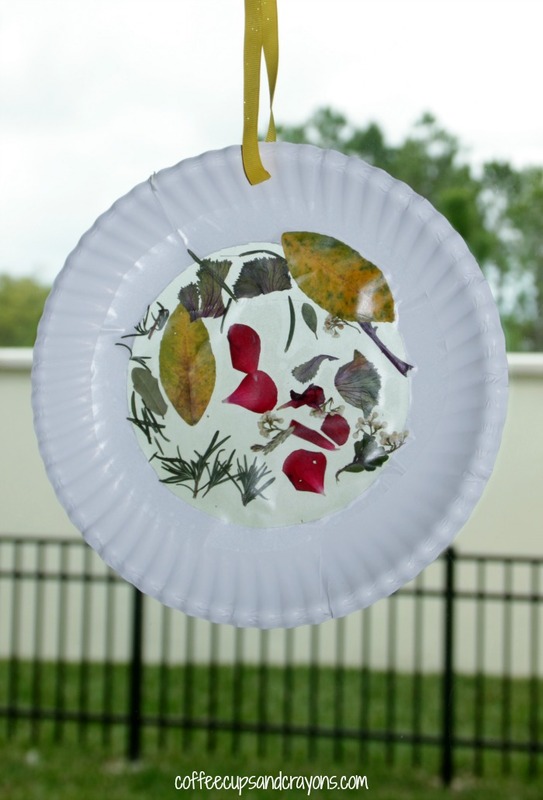 For the suncatchers she suggests changing the flowers and leaves to match the season. My preschooler also suggested making egg shaped ones for Easter and orange pumpkin suncatchers for Halloween. I have a feeling our windows will be full of lots of beautiful suncatchers year round! For more ways to create and celebrate the seasons with your family grab a copy of The Artful Year !